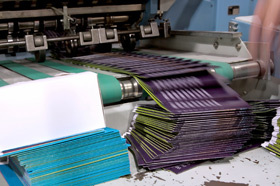 Southwest Binding & Laminating regularly supplies trade binderries with many of the products they need to provide thier clients post press finishing, document binding and specialty packaging. Highly experienced and knowledgable sales associates are ready to answer any questions. We carry high stocks of binding equipment and supplies as well as lamination materials. Same day shipping is never a problem for those last minute projects that need to be completed yesterday. Imprinted Plastic Comb Binding helps to identify the contents of the book. In many cases it is a quick reference guide, flight manual or cookbook.